Prince Buster took Camden Town by storm. He turned back the clock with his Blue Beat and Ska. Dressed in a black leather suit, dark green turtle neck top, dark glasses and black hat. Fans aged eighteen to sixty flocked to see Mr Blue Beat, the Electric Ballroom was packed. The Ska fans danced and drank, bare chested skinheads danced like crazy sweating in the summer heat. He sang all his hits and was backed by the pulsating beat of The Junction band. He summed up the night when he sang "Too Hot" to an enthusiastic crowd (no air conditioning) the sweat was rolling from his bearded chin. The rhythm was in his head as he sang each song as they had been written back in the sixties. We had grooved and danced with Gaz Mayall and the Trojans (image on right) who last played with Prince Buster at the Ballroom ten years previous, and were thrilled to be on the same bill once again. They had two members in the line up from The Top Cats, a Ska band from London. The male member Natty Bo sang a great version of "Jericho" while Megumi "Miss Megoo", played the sax. The third band, Selecter had them moving to their electric sound and high volume Two Tone set. 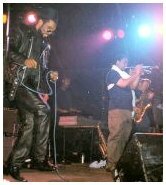 Then as the Junction band began to play, Gaz came on to introduce Prince Buster to the sound of "Al Capone" as the whole crowd erupted with excitement, at his long awaited arrival. For me his performance of "Shaking Up Orange Street" with the horns blasting and the crowd jumping was simply brilliant. At one point Prince Buster jumped down into the throng of dancers. Some of his younger fans managed to jump onto the stage and leapt off, like planes, into the arms of the crowd waiting below. I doubt if we shall see the like again, the energy and pace was unbelievable.